Just a few words about another "Finstere Flure" session. Similar to last time the game lasted a lot shorter than we had expected. This time we played without the "extended version" pieces as we believe that these only add unnecessary complexity (and thereby chaos) to the game. Things developed rather quickly mainly because of the long puddle of blood right in the middle of the board, which was used as an accelerator by sliding on it towards the exit. Walter right from the beginning used one of his three pieces as monster bait dedicated to keep the monster away from his other two pieces. This turned out to be very effective and soon three of us were able to position two of their piece within reach of the exit. Whether it was by chance or clever tactics is unclear to me, but suddenly we realized that Walter would be able to leave the dungeon with two pieces in the next but one turn without any of us being able to prevent this. My conclusion: "Finstere Flure" is too complex to make it worthwhile to track all possibilities before you make your move. Even if you do, it still leaves you with the risk that one or more players (including yourself) makes an unexpected move due to some oversight (or just out of pure fun to create havoc). Thus it's not really worth it to brood a long time about one's move. 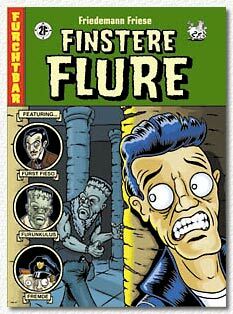 Once you have realized this "Finstere Flure" is a fast and fun game. At the time when "Karriere Poker" was first published by Hexagames I subscribed to two board game magazines: the German "Pöppelrevue" and the English "Games International". In the second issue of the latter Brian Walker, the editor of GI, described "Karriere Poker" as based on the Chinese card game "Zheng Shang You" and as a game where "there are no rules for winning"! This - besides the good rating he gave - caught my attention and I bought a copy of the game. However, the game was on the table just a couple of times in the late 80's because we did not like it that much. After nearly 15 years "Karriere Poker" seemed to be forgotten and it came as quite a surprise when Peter presented it to us as "one of the best card games" he'd played ever. With some reluctance we decided to play it in our 6 player round. The game is explained quickly: players have ranks from the "boss" to the "dishwasher". 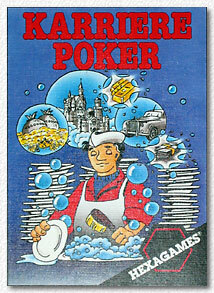 The dishwasher is the player who came last in the previous round and is the poor person who has to do all the card game related work like shuffling the deck, dealing the cards and collecting the cards played. On top of that the dishwasher must hand his three highest ranking cards over to the boss who returns his three lowest ranking cards. You get the idea: it's not much fun to be the dishwasher. Seating order is according to rank with the boss being the start player of a new round. The goal is to get rid of your cards as quickly as possible. Cards come in six each of the numbers 1 to 12 plus two jokers. The start player leads any number of cards of the same suit and all other players must either follow with the same number of cards but with a higher suit or they pass. The first player to get rid of all of his cards is the (new) Boss and the lower positions (General Manager, Manager, etc.) are assigned accordingly. If this sounds somewhat familiar to you, you are right. "The Great Dalmuti" by "Wizards of the Coast" uses a similar principle and quite interestingly, also references "Zheng Shang You" as its root. What these games have in common is the fun factor. It is equally rewarding to be able to advance from the dreaded "Dishwasher" position as it is to remain the "Boss" for some time and make use of your advantages. The game is not as much luck based as it may sound and skilful play is certainly rewarded (in our session Peter managed to remain the Boss for most of the time - no wonder he likes the game so much). But compared with "The Great Dalmuti" I like Dalmuti more. The different number of cards per suit adds more challenge and the scoring rules that come with it make it possible to celebrate an overall winner. A long time before Dalmuti was published Brian Walker of GI already suggested a scoring system for "Karriere Poker": the winner of the game is the first person to amass 5000 points. Players receive points for their position at the end of a round, from 1000 points for the boss down to 100 points for the dishwasher. In addition higher ranks who want to receive cards from lower ranks must pay 100 points per card. Moritz brought this one along and taking the fact that the game was published 10 years ago I was surprised that we didn't see it earlier on our table. On the other hand, we claim to be strategy game players and "Once Upon A Time" is all but a strategy game. The goal of the game is to get rid of all your cards before any other player does. 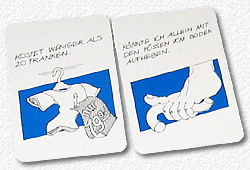 The game comes with two sets of cards: one set representing the "game ending" cards and the other set being the "story telling" cards. Each player is dealt one "game ending" card which must be used as the last cards played; these cards have sentences printed on them like "And they lived happily ever after" as we know them from lots of fairy tales. 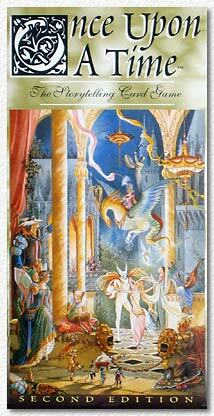 The story telling cards show items, characters and events which usually appear in fairy tales. Each player receives 6 to 10 (depending on the number of players) of these. The game rules are simple and straight forward. One player starts telling a story and may play every character, items or event card in his hand that he incorporates in the story. Other players may take over if the story telling player mentions a character/item/event that they have in their hand. 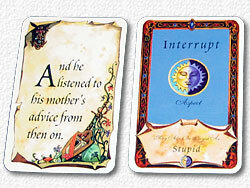 The interrupted story teller draws one new card from the deck and the round continues with the interrupter, who must continue the story. The game works well if played with a group of players who like story telling and have a good amount of creativity in this respect. If the group is really good at this a game will last less than 10 minutes and all will have had fun. If the group is too inhomogeneous some players will never get a chance to play many of their cards as they will be interrupted often and cannot counter-interrupt fast enough due to lack of story telling ideas. Finishing the game can also become quite a problem if you are interrupted just before being able to play you game ending card. Now, you must draw a new card from the story telling deck and chances are that you find yourself in the difficult to impossible situation to use that card to take over control of the story again. Given the right group of people the game is a lot of fun and creates a nice "story telling" atmosphere. Give this to a group of strategy players you either end up with lots of story interruptions that cause all sorts of twists and corners (which can be fun, too) or very fast games where a player after careful consideration tells a short story incorporating all of his cards. Only while writing this session report I realized that we played 3 games in a row where the ultimate goal of the players is to get rid of their cards as fast as possible. "Ein solches Ding" is perfectly positioned in this sequence as it leaves players with the most possibilities for discussions about the "correctness" or "meaningfulness" of the cards played and statements provided by the players. While "Karrierepoker" leaves no room for discussions or interpretations, "Once Upon A Time" may already trigger discussions about whether or not a character/item really plays a significant role in the story told. With "Ein solches Ding" I have yet to see a session where there was no discussion about whether or not "such a thing" really exists or is possible. 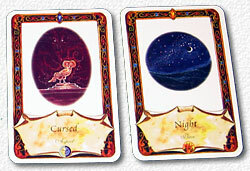 The heart of the game are cards, which describe an attribute of "things". In his turn a player adds one of his hand cards to a sequence of cards already played by the other players, thereby adding a further attribute to the "thing". The problem is that instead of playing a card any player can challenge the row of cards played and ask the player to his right to tell what the "thing" is that has all of these attributes. This usually is the source of many discussions as the "things" mentioned are often hilariously constructed items which are not accepted by the other players. We usually resort to voting as a resolution, but this leaves room for tactical votes by players left with only one or two cards. 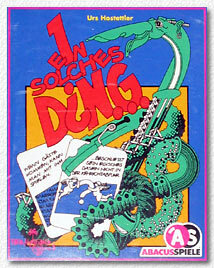 Overall, "Ein solches Ding", if played quickly and with not too much competitiveness can be a lot of fun.